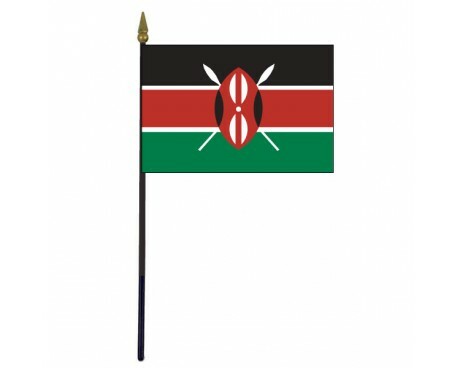 Kenya Stick Flag - 4x6"
Modern Kenya flags are a reflection of the history of both the nation itself and the African continent. 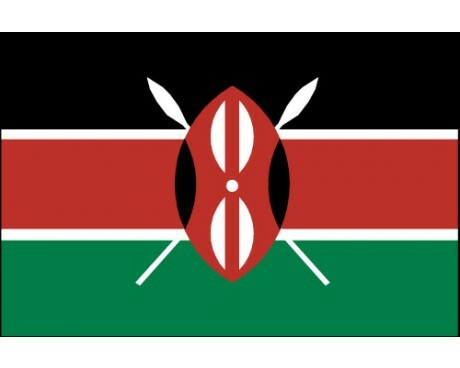 The use of flags in Kenya dates back to the British East Africa Company that once ruled part of the nation and stretches all the way through the colonial era to the modern day. Kenya flags have three horizontal bands of black, red, and green. The red stripe includes a white border. 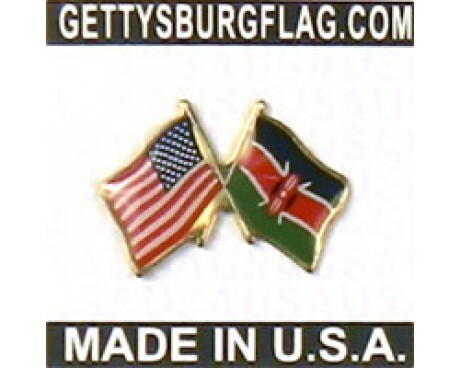 The center of the flag is given over to an emblem of a Maasai shield in front of two crossed spears. 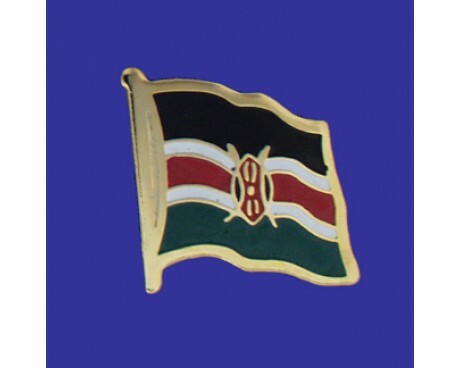 The shield and spears represent the traditional culture of Kenya's native people and the defense of the nation. The black stripe on the flag is a symbol of the African people which it shares with many other African flags. The red stripe represents the blood of the Kenyan people that was shed during the country's struggle for independence from the British Empire, and the green stripe represents the land's natural bounty. The white portions of the flag are symbols of peace and honesty. The oldest recorded flag of Kenya was that of the British East Africa Company that established the Witu Protectorate over part of the country in 1893. The flag had a solid red field with the Union Jack displayed in the center, and it fell out of use when control of the colony shifted to the government of the British Empire. Kenya gained a British colonial flag in 1921. Like other colonial flags in the British Empire, it featured a blue field with the Union Jack in the canton and a symbol that represented the colony in the fly. That symbol was a red lion, which reflected the country's wildlife. It was also a traditional symbol of Britain, which helped to reinforce the link between Kenya and the rest of the British Empire. The colonial flag fell out of use when Kenya gained its full independence in 1963. The government adopted a new flag that was modeled on that of the dominant political party, the Kenyan African National Union. That design has represented Kenya without any changes since it was first adopted, even after the political party left power.